This programme of Rossini songs covers much of the material performed by the same artists last April in the Queen Elizabeth Hall (reviewed here). However, problems encountered at the live event seem largely to have dissipated on this extremely well engineered disc from Hyperion. The greatest challenge in concert, that of performing in a large space songs that were written for the intimacy of Rossini's own Parisian drawing room, no longer exists here and even if Bruce Ford's tenor has undoubtedly lost some of its bloom and sweetness, his performances are outstanding, distinguished by stylish delivery and subtly nuanced reactions to the text. Swedish soprano Miah Persson and German mezzo Stella Doufexis are, similarly, beyond reproach in their intelligent and vocally secure performances. All three are accompanied with verve and inimitable skill by Roger Vignoles. The generous selection of songs presented here – just shy of eighty minutes' worth – includes all but one of the Soirées musicales (a duet for tenor and bass is omitted) and a selection of vocal numbers from the miscellany that was Rossini's Péchés de vieillesse. Both sets were produced after Rossini's retirement from the world of opera after the premiere of Guillaume Tell in 1829 and were composed for the weekly soirées Rossini – now something of a celebrity, wit and bon vivant – and his wife hosted in their Paris residence. All the songs are characterised by effortless musical craftsmanship and all the melodic inspiration one would expect from Rossini but it's difficult not to listen to them and lament the fact that the composer's enormous talent wasn't still being employed on larger scale forms; he did go on to write his Stabat mater and Petite messe solennelle but no further operas. However, there's elegance and humour in spades across the whole disc. Best known of the songs is without doubt 'La danza' which, although maybe not as dizzily intoxicating as it might be, is sung with elegance by Ford. He's also moving in the beautiful 'L'esule' which opens the Péchés de vieillesse – a song that's almost Schubertian in its evocation of the wanderer's melancholy Heimweh. Persson is delightfully buoyant throughout, her clean soprano a constant joy to listen to. She seems to be having great fun in the yodelling coloratura of 'La pastorella dell'Alpi', aided by Vignoles' spritely accompaniment, and negotiates the leaps of 'Mi lagnerò tacendo' with elegant ease. Doufexis perhaps has the pick of the songs with mischievous 'La chanson du bébé', a song in baby-talk whose opening bars seem to look forward to Wolf's 'Der Abschied'. Doufexis is also entrusted with the tre canzonette the make up La regata venenziana. These settings of poetry in Venetian dialect are refreshing in that they attempt to break out of the confines of the Parisian salon and come together to produce something approaching a dramatic monologue as the singer commentates on the progress of her favourite rower, Momolo, whose eventual triumph is marked with a kiss and a red flag. The three singers unite variously for the duets that are dotted around the two sets of songs. If 'la pesca' is probably one of the least interesting numbers on the disc, some of the other duets are a joy. 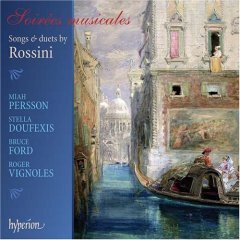 There's more Venetian cheer-leading for both Doufexis and Persson in 'la regata veneziana' from Soirées musicales and Doufexis and Ford are excellent in the beautifully written 'les amants de Séville'. Although these songs receive exemplary advocacy here, a couple of them verge on the bland. They might all have been written with what Richard Stokes describes in his notes as 'the irony and sarcasm of a composer who had already become a legend in his lifetime', but it's impossible not to feel disappointed at the distinctly undionysian feel of 'l'orgia', for example, and the fact that Rossini rarely seems tempted to push the boundaries of his musical language. However, so many of the songs are irresistible in their charm and craft that this disc can only be warmly recommended.